Core Six One is our most accessible Fitness product! With Core Stix One, users with mobility challenges will find it easier and more fun than ever before to strengthen every part of their body. Accessibility was our top priority with Core Stix One. The platform height is only 1/8 of an inch thick, making it accessible for any user, in a wheelchair, walker, or otherwise! And, there are an endless number of exercises that can be performed on Core Stix - for the entire body. Core Stix One’s space-saving design can be easily moved, rolled, and stowed just about anywhere. 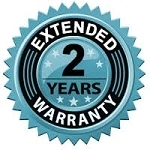 As an added bonus, all Core Stix One Active Aging Packages qualify for money saving tax benefits under the ADA. Click here for more information. 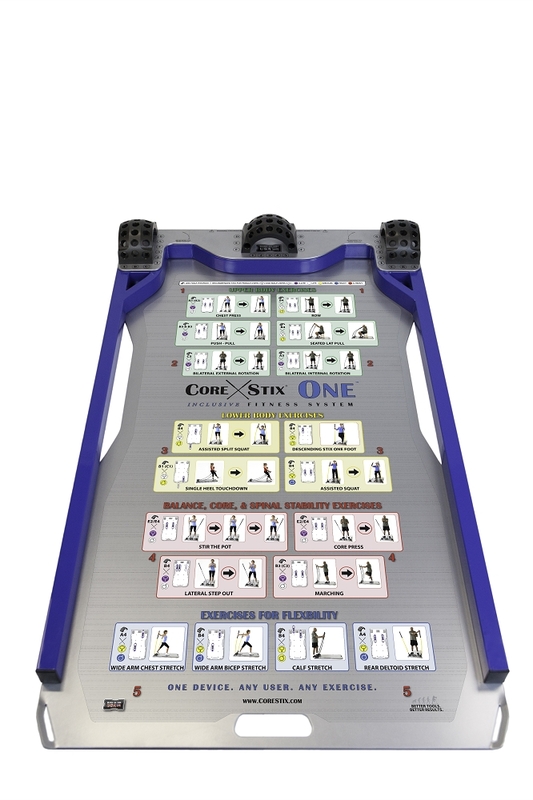 Core Stix One is based on a nearly decade long foundation of research, development, and manufacturing of high quality Core Stix fitness and therapy products! Just about any user can perform an endless range of strength, mobility, balance, & flexibility exercises on one system. Unrestricted movement in all three planes of motion (3D) for better simulation of sports or activity specific movements. 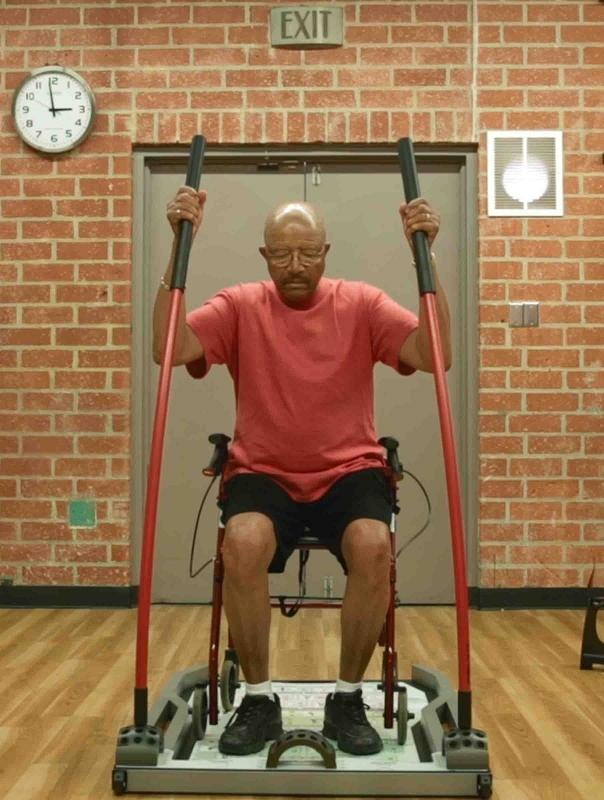 Use in standing, kneeling, and seated positions for any aged patient. There are even a full range of lying exercises for capable users. 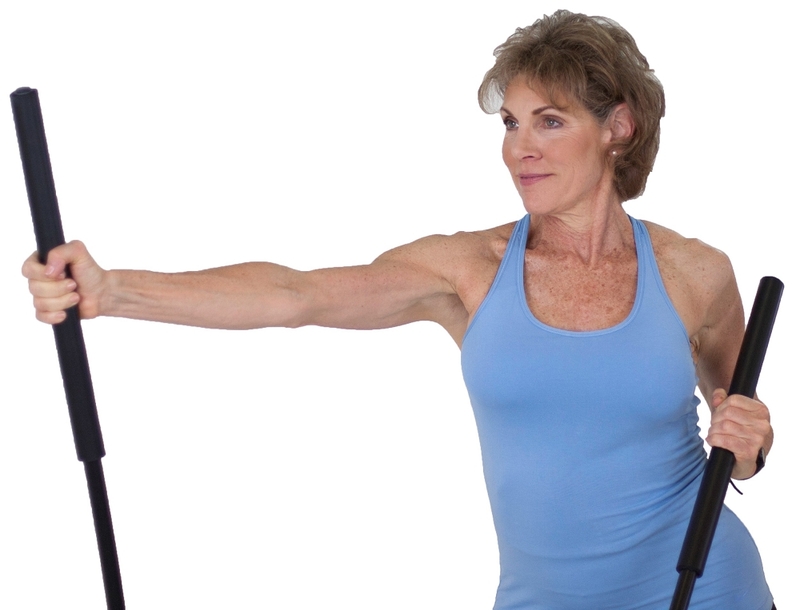 Stix provide progressive resistance, for safer and lower pain joint loading. Space-saving design is compact, lightweight, rollable, and stowable just about anywhere (leaned up against the wall, under a table). 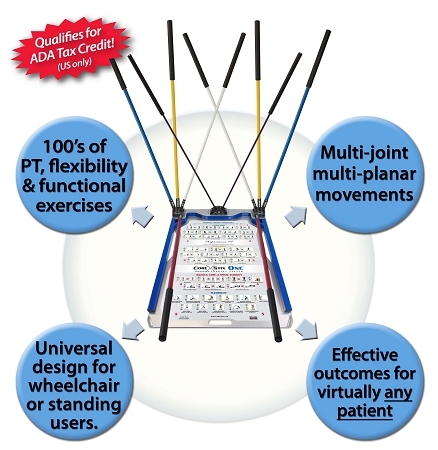 World-class instructional programming for senior users comes with every PT Package sold. Only 1/8 inch tall at rear entry end! 5 Foot Long Stix: One pair each of the following four resistance levels (X-Lite, Lite, Medium, Heavy & X-Heavy). 4 Foot Long Stix: One pair each of X-Lite & Lite. Double Stix Stand for storing the Stix when not in use. Slip resistant high quality Active Aging graphics on top surface of platform. Customize the graphics with your logo for powerful branding. See below for details. 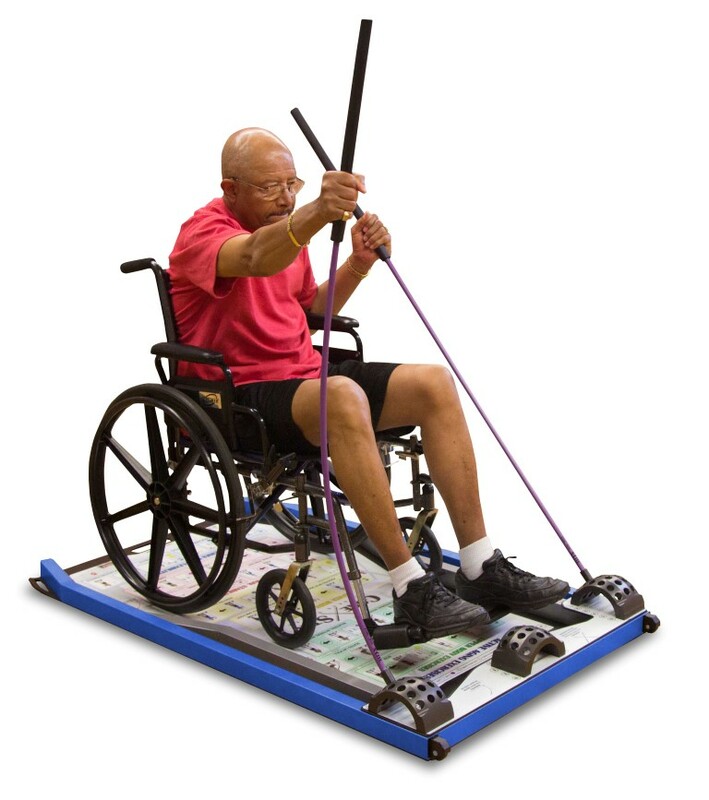 Full color Active Aging instructional manual with exercises for balance (fall risk reduction), upper body strength, lower body strength, and flexibility. Active Aging instructional manual and HD quality videos. Full color functional fitness instructional manual with over 50 functional fitness exercises. Core Stix One was designed by the founders of Core Stix – a former NASA Space Shuttle Mechanical Design Engineer and an NHL Stanley Cup winning Strength & Conditioning Coach – for superior performance, simplicity, and versatility. Side rail height: 2.0 in above Platform. Silver & blue durable powder coat. 53 different support holes for endless adjustability and adaptability. Precision machined from solid high strength aluminum. Type III hard anodize coating for superior strength & durability. Color coded and labeled for easy identification. Latex free. Epoxy based high strength fiberglass. Many years in development for many years of performance! Platform includes integrated wheels for easier portability. Easy to move & store (stores upright on wheeled end or under a table). Handles on lightweight end make it easy to tilt platform for rolling and upright storage. Integrated handles on sides of platform for easy carrying. 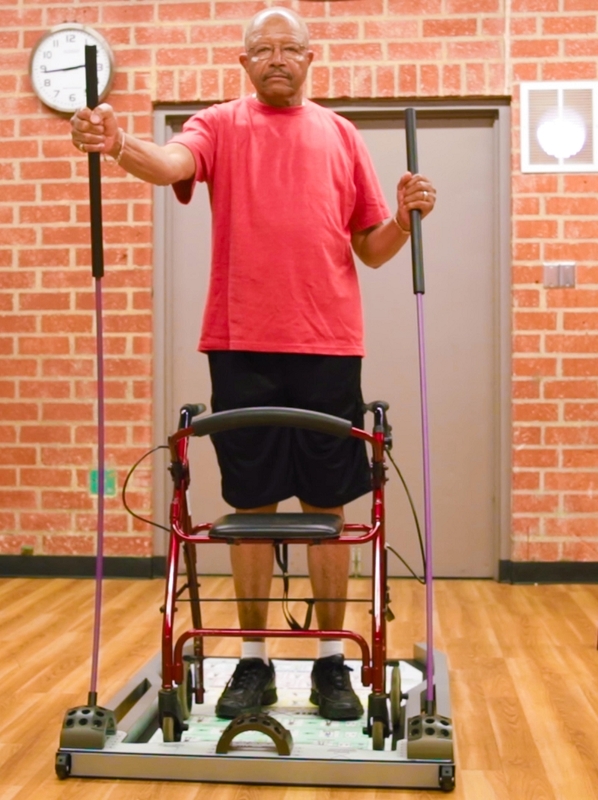 The Core Stix One Fitness Package qualifies under the Americans with Disabilities Act (ADA) for a tax credit (for small businesses – $1,122.50 tax credit available with every Core Stix One Package purchased – up to $5,000 total) or tax deduction (for non-small businesses). The amount of the credit is 50% of the amount of eligible access expenditures for a year that exceed $250 but do not exceed $10,250. No other deductions or credits are permitted for any amount for which a disabled access tax credit is allowed. The maximum allowable tax credit allowable is $5000. For example, if your tax liability at the end of 2014 is $2,000 and you are eligible for a $1,000 ADA tax credit, your resulting tax liability would be $1,000. That is $1,000 back in your pocket! Regarding eligibility, an eligible small business is defined as any person who elects to claim the disabled access tax credit and either: (1) had gross receipts for the preceding tax year that did not exceed one million dollars; or (2) had no more than 30 full time employees during the preceding tax year. Please click here for more detailed ADA information regarding the tax deduction and tax credit. Please click here for the ADA tax form for claiming your ADA Tax Credit. Please consult your tax advisor to verify eligibility. Add your logo to any graphics for $175.00. Increase your brand visibility with this valuable offer. Just add in the custom graphics option to the shopping cart, and follow the instructions below. ** Special instructions for custom graphics upgrade: For best results, please email to orders@corestix.com your clinic’s or business’s logo. The preferred format is a vector format (i.e., either .ai or .eps – please be sure that all fonts are converted to outlines). If that format is not available, then please send it as a .png or .pdf (300 dpi or greater, transparent background), minimum 8 inches width of artwork. If none of these file formats is available, then please send it as a .jpg (300 dpi or greater, minimum 8 inches width), though the above-listed file formats are preferred.